Honolulu Engagement portraits are the first fun part of the wedding photography experience. Over the years, they have become very popular. A good engagement photo session can yield more than just a nice formal portrait of a couple suited to become a centerpiece in their future living room. Besides just formal portraits, we strive to also create a mix of photographs with a variety of looks, showing love, the couple’s chemistry, their joy from being together, and how their characters interact. If you would like to review my photography packages and services. Here is a link to my engagement photography packages. If you have any questions regarding setting up a first birthday photo session, please contact me. I’d Love to hear from you. :)I look forward to the possibility of capturing beautiful images of you and that special someone. An engagement, betrothal, or fiance' is a promise to wed, and also the period of time between a marriage proposal and a marriage. 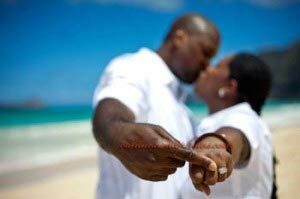 During this period, a couple is said to be betrothed, "intended", affianced, engaged to be married, or simply engaged. Future brides and grooms may be called the betrothed, a wife-to-be or husband-to-be, fiancée or fiancé, respectively. The duration of the courtship varies vastly and is largely dependent on cultural norms or upon the agreement of the parties involved. Long engagements were once common in formal arranged marriages, and it was not uncommon for parents betrothing children to arrange marriages many years before the engaged couple was old enough. The origins of European engagement in marriage practice is found in the Jewish law (Torah), first exemplified by Abraham, and outlined in the last Talmudic tractate of the Nashim (Women) order, where marriage consists of two separate acts, called erusin (or Kiddushin, meaning sanctification), which is the betrothal ceremony, and nissu'in or chupah, the actual ceremony for the marriage. Erusin changes the couple's interpersonal status, while nissu'in brings about the legal consequences of the change of status. (However, in the Talmud and other sources of Jewish law there is also a process, called Kiddushin, corresponding to what today is called engagement. Marrying without such an agreement is considered immoral. To complicate matters, erusin in modern Hebrew means engagement, not betrothal.) This was later adopted in Ancient Greece as the gamos and engeysis rituals, although unlike in Judaism the contract made in front of the witness was only verbal. The giving of a ring was eventually borrowed from Judaism by Roman marriage law, with the fiancé presenting it after swearing the oath of marriage intent, and presenting of the gifts at the engagement party. Customs for engagement rings vary according to time, place, and culture. An engagement ring has historically been uncommon, and when such a gift was given, it was separate from the wedding ring. 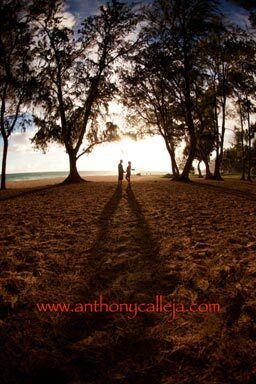 As a Hawaii Photographer, I offer affordable Honolulu Engagement Photographers services with beautiful Honolulu Seascapes and landscapes for a backdrop.